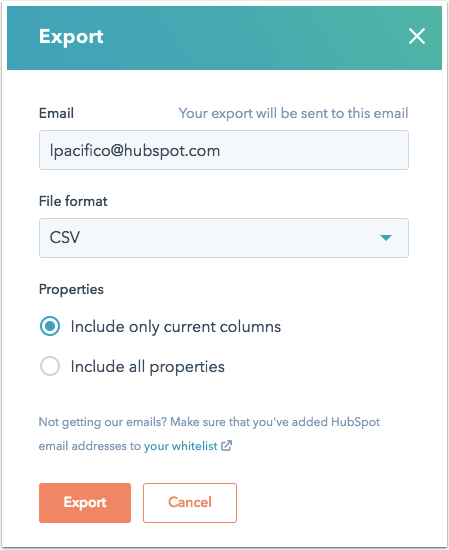 Export contact, company, deal, or ticket records that exist in a filter and view a list of the exports done in your HubSpot account. 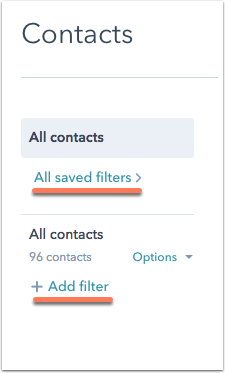 Click Add filter in the left sidebar to segment your records or click All saved filters to apply an existing saved filter. Please note: if you'd like to export all records, select All contacts, All companies, All deals or All tickets in All saved filters, or ensure no filters have been selected. 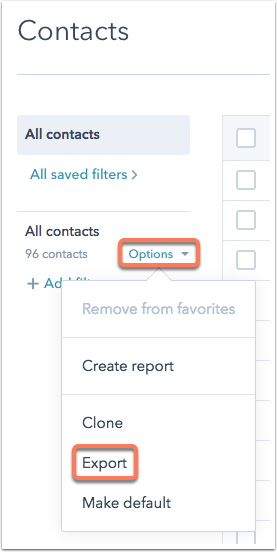 Once you've filtered your contacts, companies, deals, or tickets, in the left sidebar menu, click the Options dropdown menu and select Export. In the dialog box, enter the Email to receive the export and click the File format dropdown menu to select the format for your export file. Next, select either the Include only current columns radio button to include only the properties currently set as columns in your filter or Include all properties radio button. Click Export to receive an email with a download link to your export file. Engagements in a contact, company, deal or ticket record cannot be exported. Download the export file once you receive the email. After 30 days of being created, all download links to export files will expire. If you have admin access, you can view a list of exports done in your HubSpot account. In the left sidebar menu, click Import and Export. You'll see a list of the exports from your HubSpot account with the name of the user, the date of export, the saved filter exported, and the number of contacts, companies, or deals exported. Click the Contacts, Companies, Deals and Tickets tabs to see exports of each record type. Can I export or share exported calls? At this time, you cannot export or share any recorded calls from a contact, company, the HubSpot Sales product. If you have the resources, you may work with a developer to use our engagements API endpoint, where the ‘recordingUrl’ object links to a recorded call. Can I export notes from my contact, company, deal, or ticket records? At this time, you cannot export notes added to your contacts, companies, deals or tickets. Notes are considered engagements and are not stored as properties for export. If you have the resources, you may be able to work with a developer of your choice and use our engagements API endpoint to extract notes for individual contacts.